Gyula BAKACSI, Professor of Budapest Business School – University of Applied Sciences (BBS). Grades and degrees: MSc 1983, Corvinus; ETP certificate 1992-93, Harvard Business School; Ph.D. (CSc) 1994, Hungarian Academy of Sciences; habilitation 2014, Sopron University. Professor Bakacsi has a 35-year academic career, combining management and academic roles. He had been developed and taught Organizational behavior in BSc, Master, MBA and Ph.D. programs in Hungarian and English languages; author of the first comprehensive OB text-book in Hungarian. Country Co-Investigator of Hungary in GLOBE Research program (62 nations cross-cultural comparative research on culture and leadership). He published 18 books (as author or editor), 37 book chapters, 26 articles (8 in English) with 2.479 independent citations. He had been vice-rector (2000-2002) and head of Department Organizational Behavior (2005-2013) at Corvinus University of Budapest; Dean (2004-2008) and head of the Department of Business Administration (2003-2013) at Sapientia Hungarian University of Transylvania, and head of Health Manager master program at Health Services Management Training Center, Semmelweis University (2013-2016). Founding member of the Doctoral School of Entrepreneurship and Business at BBS. So far 8 of his students obtained Ph.D. degree. He is member of the Member of the Plenum of the Hungarian Accreditation Committee (HAC) since 2012, Chair of the Social Sciences & Quality Assurance and Development Committees of HAC. Elected member of the General Assembly of Hungarian Academy of Sciences since 2013. He is the Chair of Economics and Business Administration Committee of the National Council of Students’ Scientific Conferences (NCSSC) since 2003 and member of the Presidium of NCSSC since 2009. He is the Chair of Business and Management Committee of the Hungarian Academy of Sciences since 2018. Dr. Károly Balaton was full-time professor at the Corvinus University of Budapest and its predecessors. Since February 2015 he is full-time professor at the Faculty of Economics, University of Miskolc. Since September 2018 he is private professor at the Corvinus University of Budapest. At Corvinus University he was head of department and deputy director of institute, and served as head of PhD programme between 2005 and 2011. At University of Miskolc he is head of department within the Institute of Management, and chairman of the doctoral programme. He has got the degree of candidate of sciences in 1987 and Doctor of the Hungarian Academy of Sciences is 2004. His research and teaching areas are Management and Organization, Strategic Management, and Social Innovation. Between 2011 and 2017 he served as chairman of the scientific committee of Business Administration at the Academy of Sciences. Mariann Veresné Somosi, PhD has been teaching at University of Miskolc since 1986, at present she is full-time professor. Previously she served as vice-dean for teaching affairs, and since 2010 she is the director of the Institute of Management. She has been the dean of the Faculty of Economic Sciences since 2014. Her teaching and research areas are Management and Organization, Performance Management and Social Innovation. She is member of the Social Sciences Committee of the Hungarian Higher Education Accreditation Committee, and since 2019 she has been the member of the Supervisory Board of the organization. She is member of the scientific committee for Business Administration and head of its Education Working Committee withing the Hungarian Academy of Sciences. Professor Elena Horská is the Dean of the Faculty of Economics and Management and professor of Marketing and Management at the Department of Marketing and Trade at the Faculty of Economics and Management of the Slovak University of Agriculture in Nitra. She was Vice-dean for international relations at the Faculty of Economics and Management between 2003-2010 and vice-rector for international relations of the Slovak University of Agriculture in Nitra between 2010 - 2014. Her main research orientation includes internationalization within and beyond EU borders, food marketing (including local food producers promotion) and consumer behaviour. In the academic positions she has been initiating several academic mobility programs, 3 double degree programs, new academic partnership and innovative forms of public relations activities at the university and faculty level as well as links with the business sphere. In 2011 she was a visiting professor at the Delhi School of Professional Studies and Research in New Delhi, India, in 2011 and 2012 a visiting professor at the Kazakh National Agrarian University in Almaty, Kazakhstan, she was also Erasmus teacher in Finland, Italy, Portugal, Spain and Ireland and CEEPUS teacher in Croatia, Hungary, Austria and Poland. She has been a successful project coordinator or local coordinator of 6 national or international research projects and 24 international educational projects. Currently, she coordinates national research project “The Use of Consumer Neuroscience and Innovative Research Solutions in Aromachology And Its Application in Production, Business and Service” and support activities related to new marketing research techniques neuromarketing including at newly open Laboratory of Consumer Studies at the Faculty of Economics and Management. Prof. Dr. László SZERB completed his Masters at the University of Pécs, Faculty of Business and Economics in 1984, and in 1994 he earned a PhD in Economics at West Virginia University. 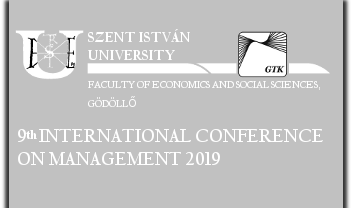 Currently he is a full professor and the head of the Department of Management Science at the University of Pécs, Faculty of Business and Economics, and the Director of the International PhD Program in Regional Development. He has been a visiting professor in many European countries including Austria, Belgium, Denmark, Finland, Ireland, Italy, the UK and in the US. Besides a wide-scale experience in teaching during his academic career, his current subjects are mainly related to entrepreneurship, entrepreneurship policy, small business management, competitiveness; and he also gives lectures in regional research methods and business development at the Doctoral School of Regional Policy and Economics. He participated as a leading researcher or team member in several international and national research projects. In 2001-2016, he was the leader of the Hungarian team in the Global Entrepreneurship Monitor (GEM) international. Fuelled by his experience in the GEM projects and more than two-decade academic research, he established The GEDI Institute and along with Professor Zoltan J. Acs founded the Global Entrepreneurship Index (GEI) that is the first tool to track national-level entrepreneurship and economic development in European as well as in global economies. He is also a founding member of the Global Competitiveness Project, together with Esteban Lafuente, aiming to research and examine small business competitiveness. His research work is devoted to entrepreneurship, small businesses, entrepreneurial finance, and most recently he is dealing with the measurement of small business competitiveness and digital entrepreneurship. He is the founding member of Entrepreneruship Research and Education Network of Central European Universities (ERENET), member of the Hungarian Statistical Association, former editor in chief of International Journal of Marketing and Management (mainly Hungarian language) and editor of Small Business Economics, a leading academic journal.